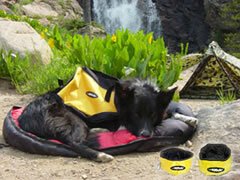 The Feedbag - Incredibly light yet durable, this bag holds and serves your dog's food. Just fill it with food, pull the drawstring tight and you're ready to go. 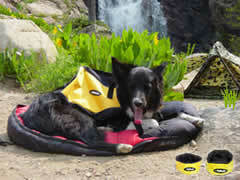 When it's time to eat, just open the drawstring and the bag becomes a dog dish. Machine washable. Let your dog carry their own goodies. They would be happy to help out.